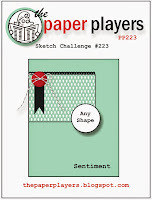 Today's card uses the sketch from The Paper Players and the colors from a new-to-me challenge called Retro Rubber Challenge, where as well as normal challenges, we also need to use older stamps. I started stamping back in about 2001 and have quite the collection of single stamps from the likes of PSX, Hero Arts, Penny Black as well as several unmounted plates. 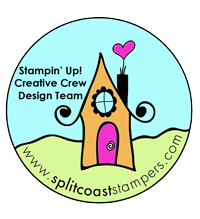 Then in about 2004, I discovered Stampin' Up and spent the next several years collecting as many sets as I could. 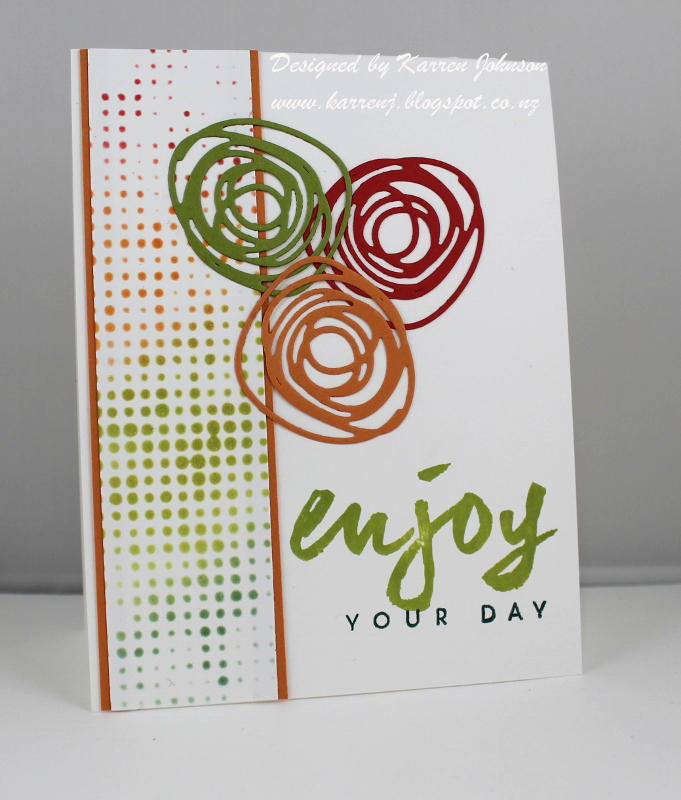 In 2007, Stampin' Up came to New Zealand and I signed up to be a demonstrator. I let my demoship drop in October, but my favorite Stampin' Up set is still the first one I bought - Botanicals - and I've used it today. 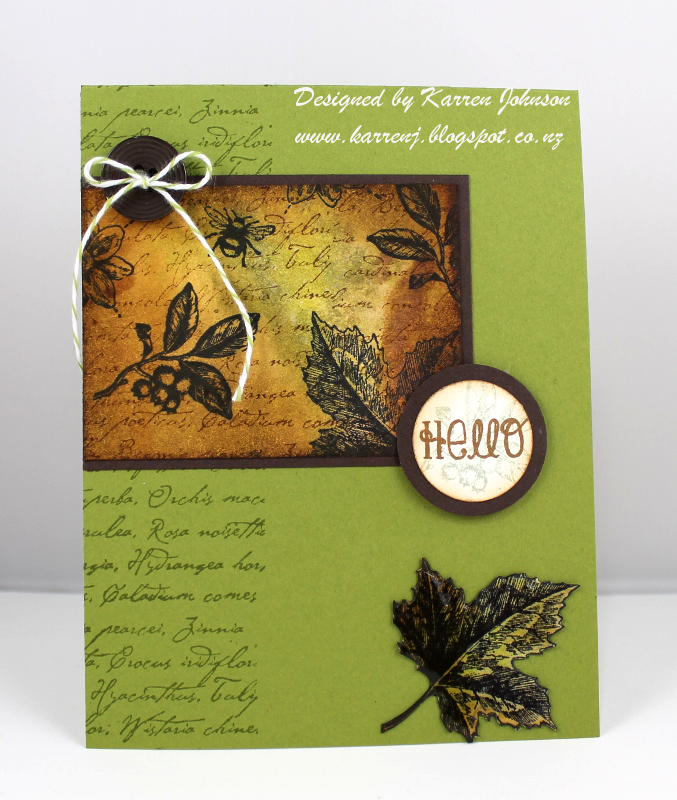 I started out with an Old Olive card base and stamped the text stamp down the left hand side. The central panel started out as a manila tag. I smooshed several distress inks onto my craft mat and spritzed with water before running the tag through it to pick up the ink. Once that was dry, I stamped various images using Archival ink and cut it down to size before sponging the edges with Vintage Photo ink. The maple leaf at the bottom was cut from the excess tag and covered with Glossy Accents before being adhered to the card base. 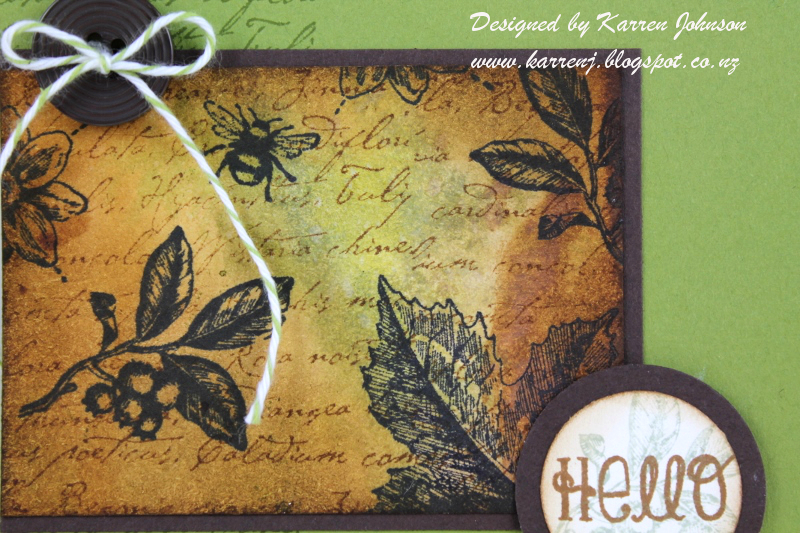 The sentiment is from Verve and stamped in Walnut Stain ink on top of a second-generation stamp of the olive branch. 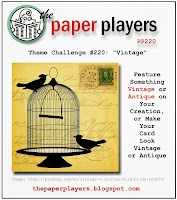 Edited to Add: This card won at Retro Rubber Challenge and got a shout out at Paper Players. I decided to make a birthday card, which may end up going to my soon-to-be 17 year old son. I started with a white card base and a white top panel. 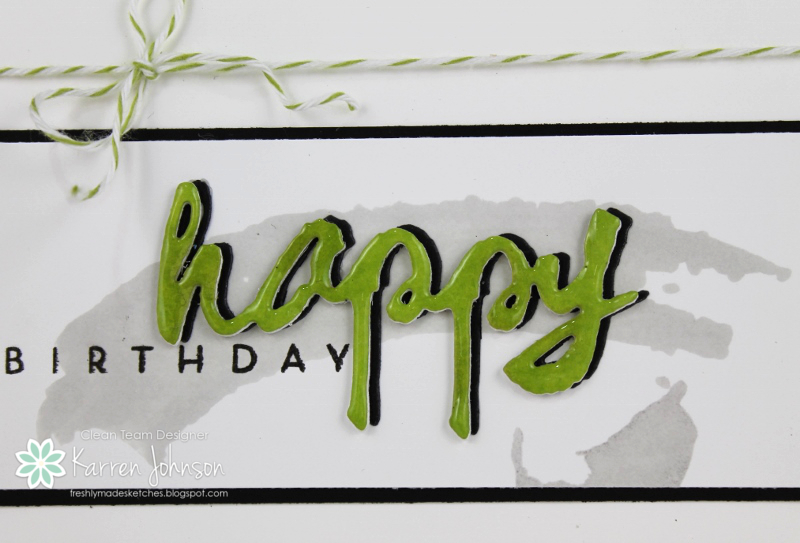 I stamped a couple of paint splashes using Fog ink and then stamped the word Birthday from PTI's Wet Paint set. For the die cut "happy", I cut three out of Green Apple cardstock and one from black cardstock, stacking them all up, but offsetting the black one slightly to create a shadow. I clear-embossed the top layer a couple of times to give it some dimension. I layered that panel onto a piece of black cardstock and finished off with some Lucky Limeade baker's twine. 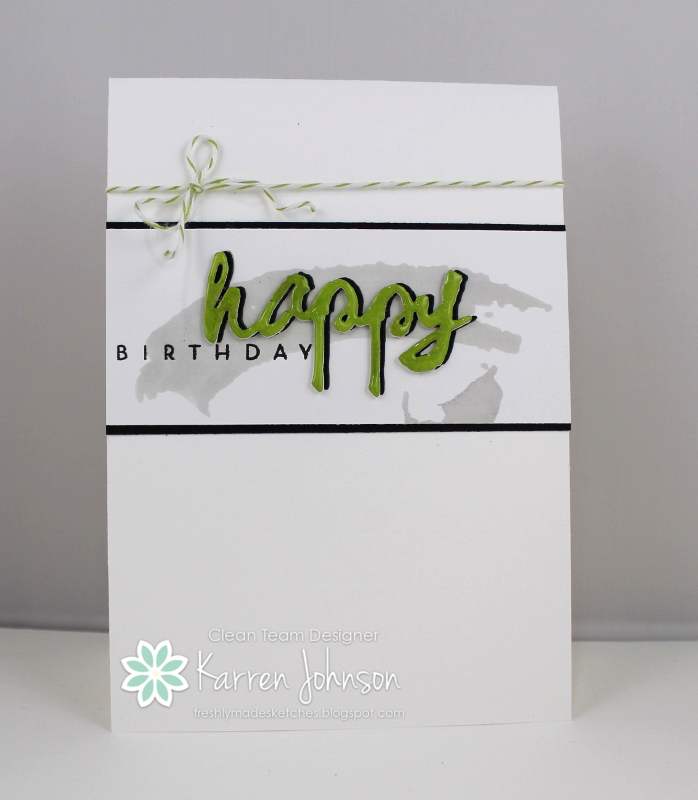 I'm entering this card into the Sweet Stampin' birthday challenge. Thanks for visiting. The rest of the design team have some amazing inspiration for you, so be sure to check them out. Hi! Today's card was made using the sketch at Fusion. The only part of the inspiration photo I used was the music notes and I didn't make a Christmas card. I decided I wanted to use Sea Glass and Surf Blue - two beautiful colors from Simon Says Stamp. That led me to making a baby card. I die cut my white card base with a stitched rectangles die. I then layered on another white panel which had been stamped with a music notes background, using Sea Glass ink. I then cut an open circle from Surf Blue and a smaller circle from Sea Glass. The sentiment comes from PTI and I finished the card off with a white button and some blue twine. Hi and welcome to another Merry Monday challenge. 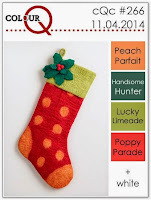 This week, the lovely Bonnie is challenging us to use green, red and white in our cards. Thanks for visiting. Please join us and upload your card to our gallery. With the exception of the sentiment, this card is SUO - something I haven't done in a long time! I started out with a piece of Very Vanilla and randomly sponged Soft Suede, Early Espresso and Cajun Craze over the panel, making sure to overlap the colors. I then flicked water onto the panel before running it through the Big Shot with the Tiny Triangles embossing folder. I cut the panel into three sections and layered them onto another piece of Very Vanilla. The centre panel is popped up on foam tape to add a bit more interest. 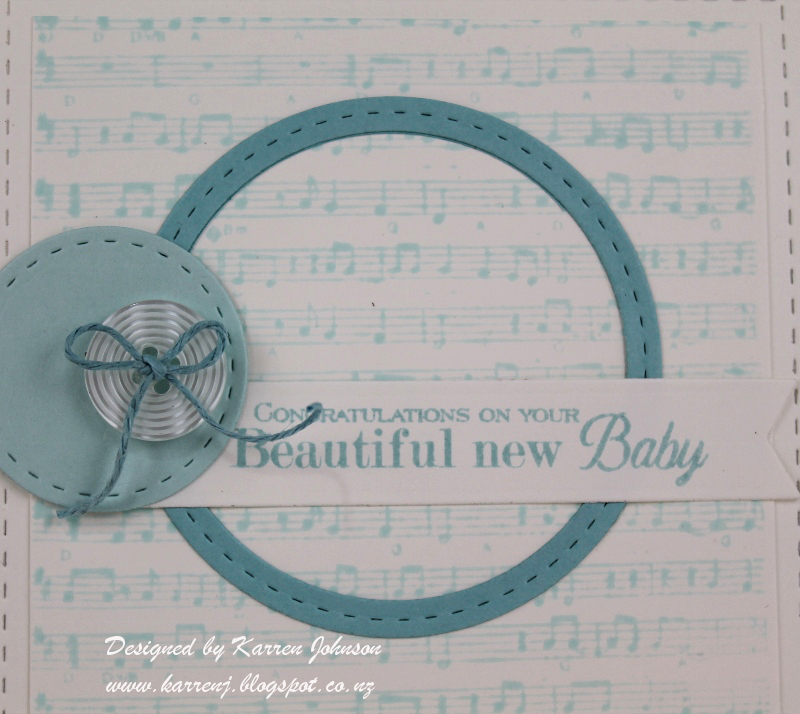 The sentiment is from Simon Says Stamp and was stamped in Soft Suede and also run through with the same embossing folder. And that's it! Edited to Add: This card got top honours at Colour Me and Just Add Ink. 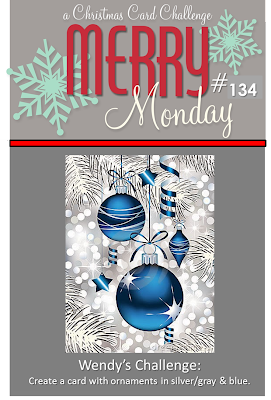 Today's card was made for a few challenges: Tuesdays Morning Sketches, Simon Says Stamp's Wednesday Challenge theme of Thanks/Thanksgiving, and the color challenge at ShowCASE Your Style. 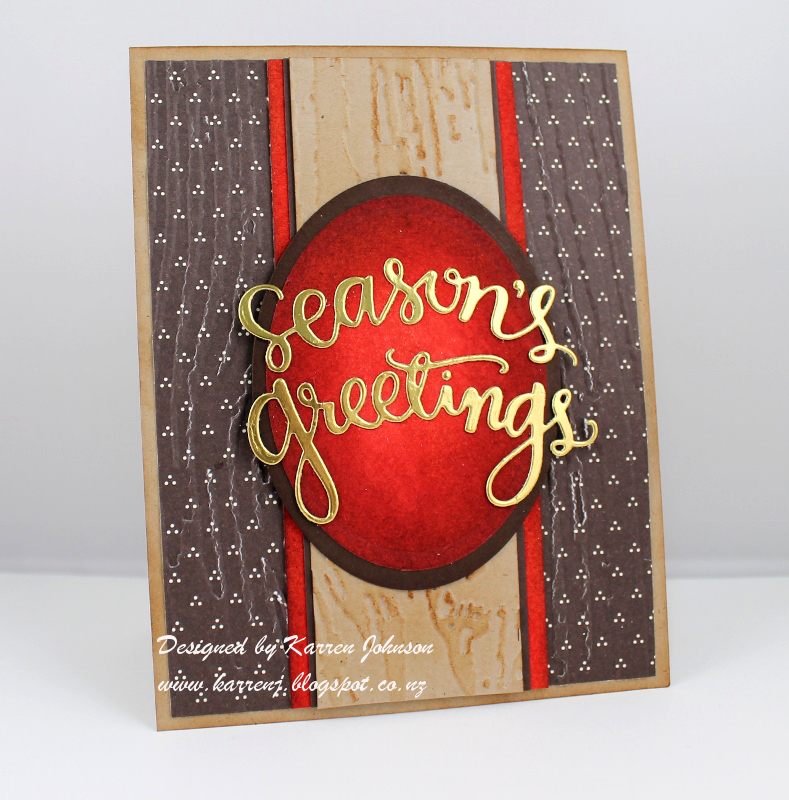 I dug through my stamps to find a really old Stampers Anonymous stamp and used Cold Laminate and Gold Leaf to create a beautiful background for the image. The rest of the card is fairly self-explanatory. I used SSS Fog cardstock to frame the central image and also as a layer on the right hand side. 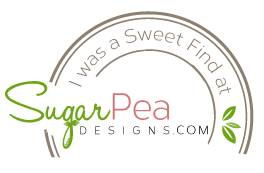 The die-cut sentiment represents the banner in the sketch and the enamel dot the button. It's Freshly Made Sketches time - one of my favorite days of the week! 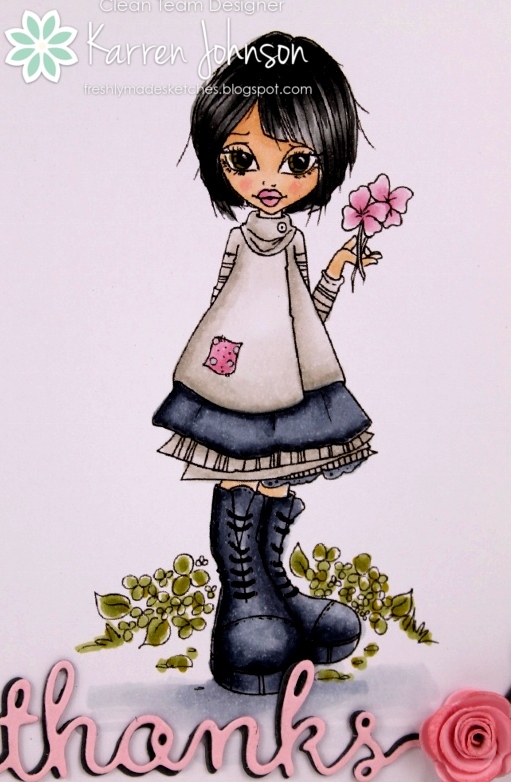 Today, the very talented Cindy Hall has a fabulous sketch, which offers so many opportunities to make it your own. I kept my card low-key and unfussy as it's destined for a male ex work colleague who is having cancer surgery next week. 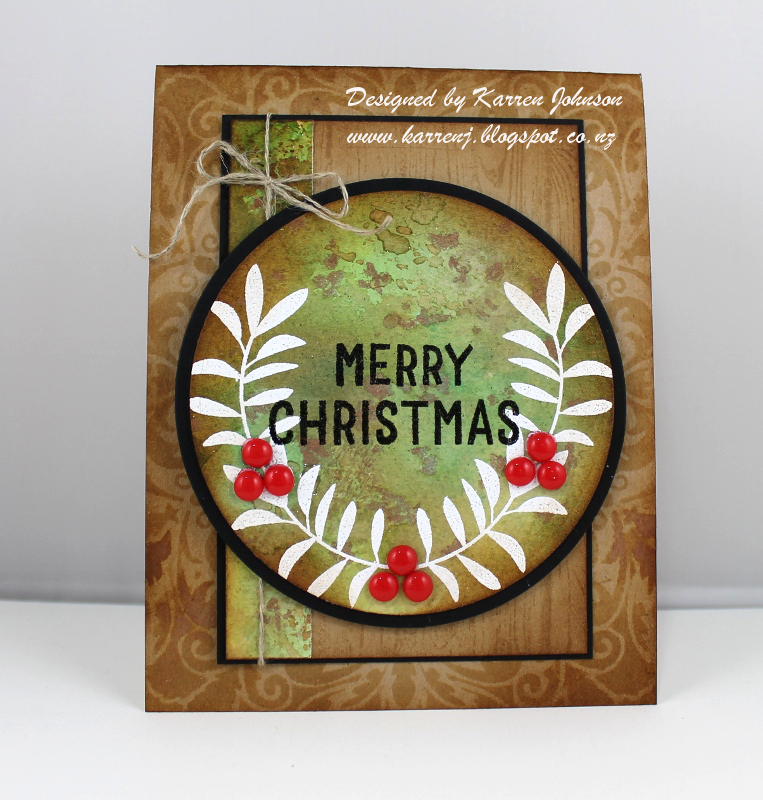 For the background panel on the sketch, I chose to use embossing paste and the Rays stencil. I colored the paste with some Goldenlocks ink to match the reeds I stamped along the bottom of the smaller panel. 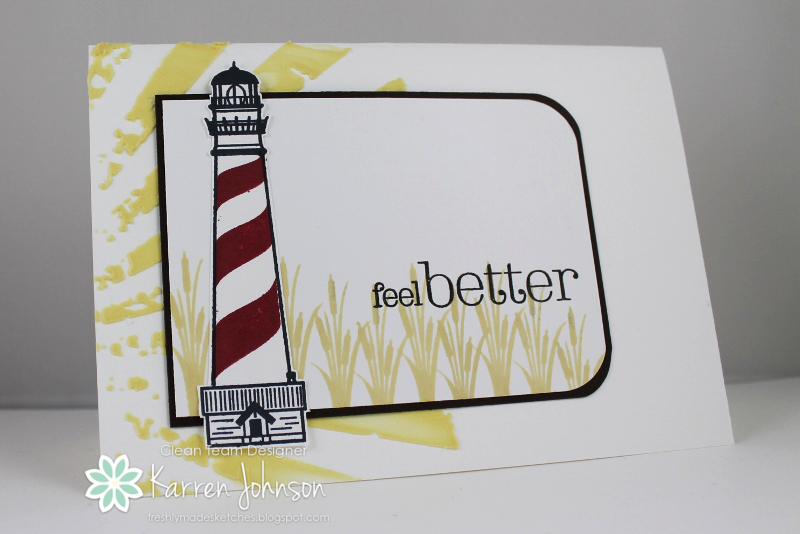 I stamped the lighthouse and fussy cut it and that represents the top vertical panel on the sketch. 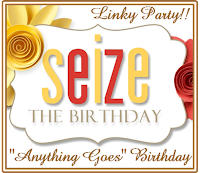 The sentiment comes from what is fast becoming my favorite sentiment set - Say it in Style by Clearly Besotted. 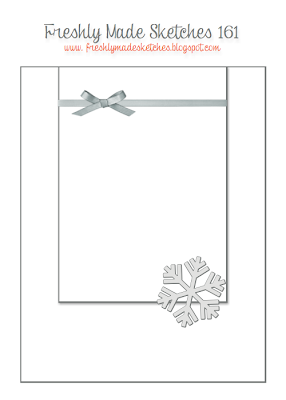 No frills or embellishments on this card because (a) it's for a man and (b) it's going through the mail. Thanks for visiting. The rest of the design team have some knock-out cards to inspire you so check them out. Hi and welcome to Merry Monday. 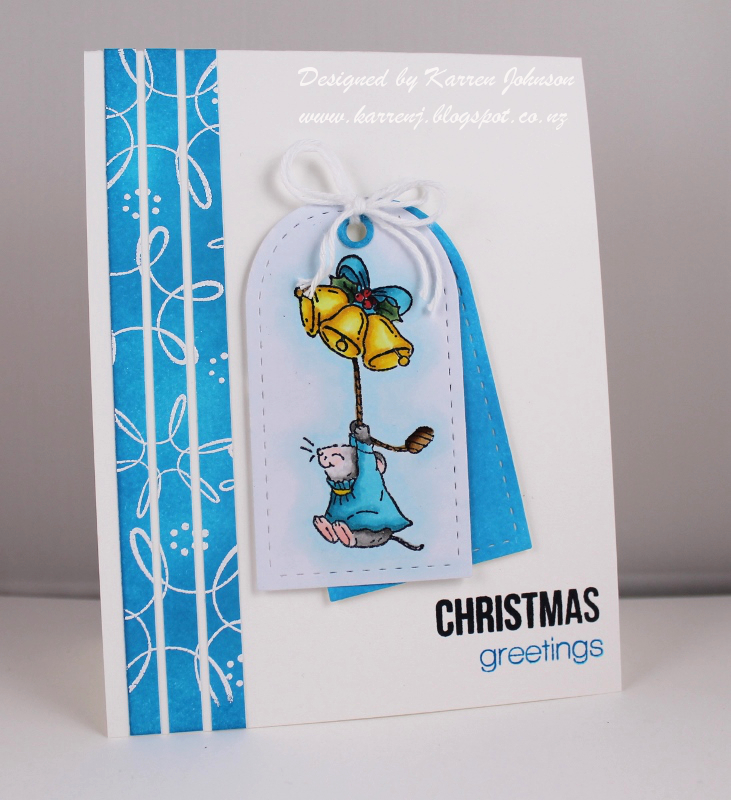 This week, Sue has challenged us to create a card featuring Christmas bells. 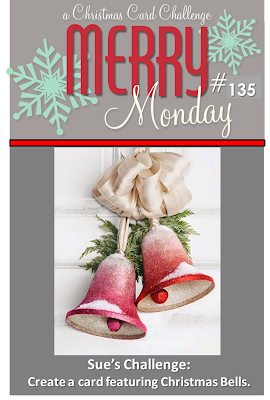 For my card, I first had to find an image featuring Christmas bells! As soon as I spied this image in the Jolly Follies set, I knew what I wanted to do. 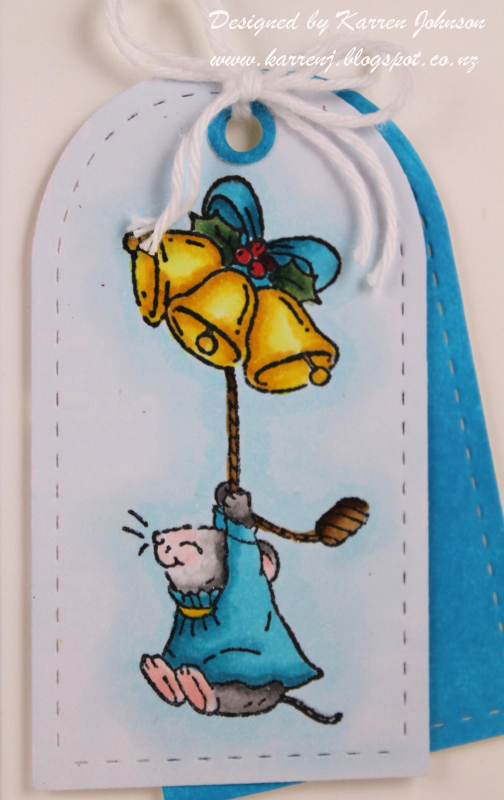 I cut a tag, then stamped and colored this adorable little mouse. For the blue panels, I sponged Island Blue ink onto white cardstock. I then white embossed some of the ultra-modern snowflakes from Freshly Fallen and cut the panel into three strips. 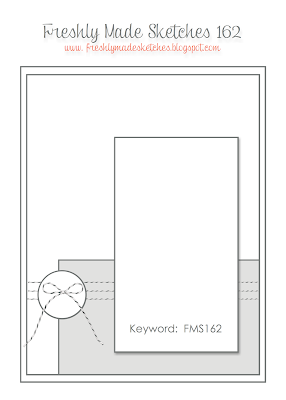 The tag is raised up on foam tape. The sentiment was stamped in black and Island Blue ink. Thanks so much for visiting. 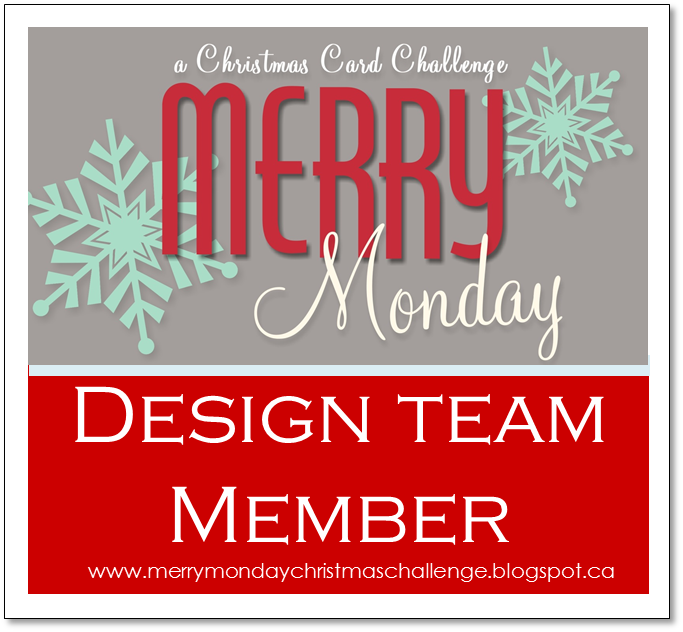 Please head over to Merry Monday to check out the rest of the design team's inspiration. Hi! It's been a few days since I posted - I wasn't feeling like stamping. I know, crazy, right! 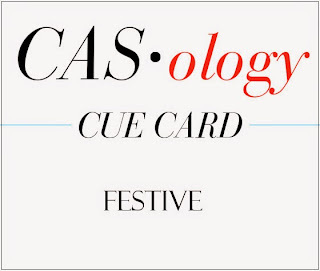 Anyway, I did make up a little tag for the challenge at CASology, where the cue word is Festive. 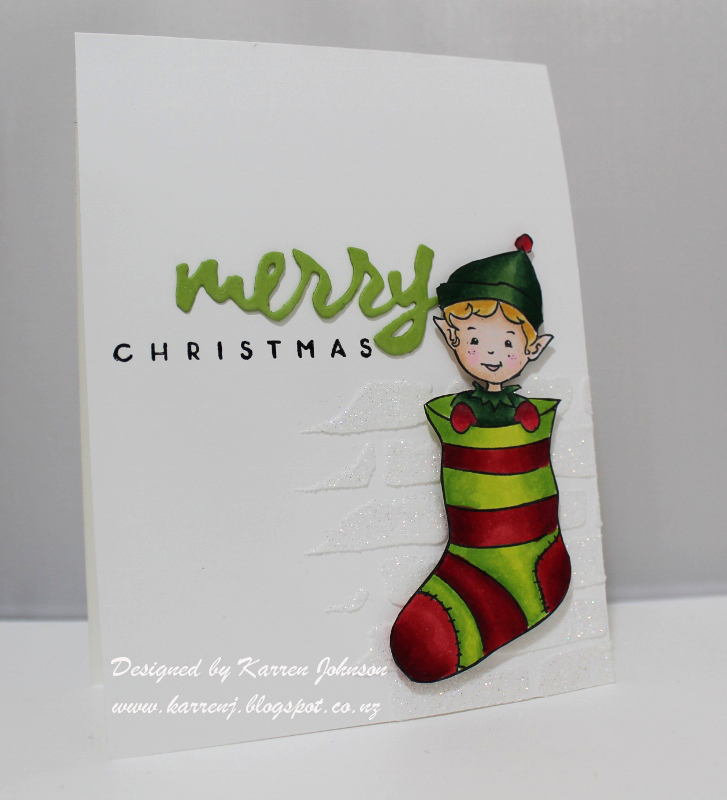 I used a new stamp set called Merriest Elves from WPlus9. These are the cutest little elves! 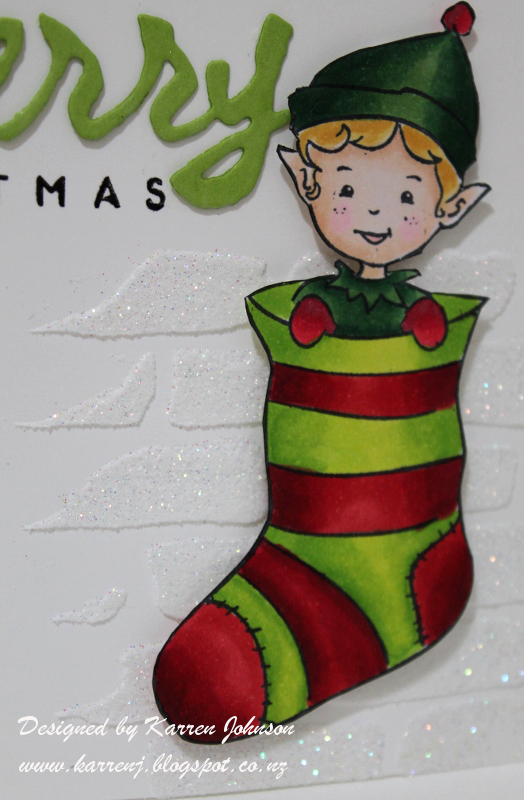 I stamped my elf onto white cardstock and colored him in. I went for two different shades of green and two different shades of red. I also stamped the "To" and "From" onto the stocking stripes. 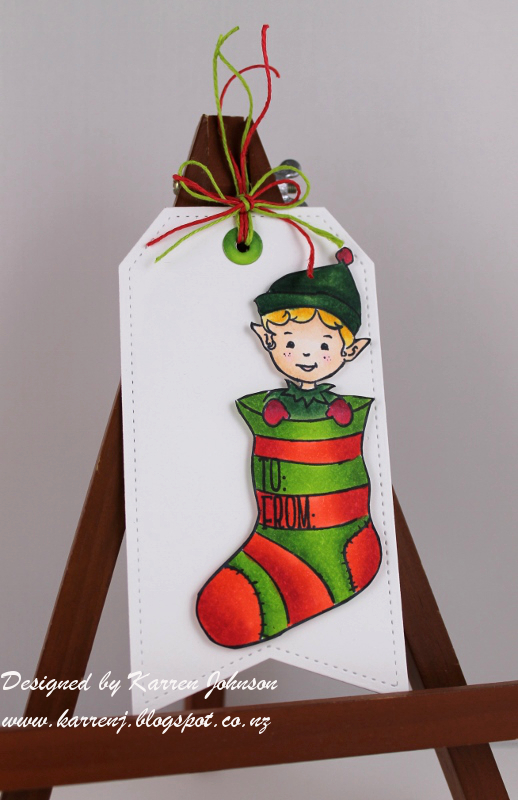 I cut him out and popped him up on a white stitched tag, then ties some twine onto the top. This is a short and sweet post today. Thanks for visiting! 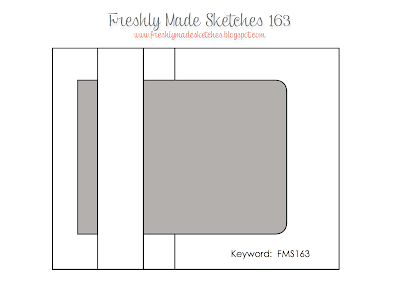 Welcome to Freshly Made Sketches. Our sketch this week is from the very talented Kim Singdahlsen. I used my new Papertrey Ink goodies again for this card - including the Linen Impression Plate which I've wanted since it was first introduced! 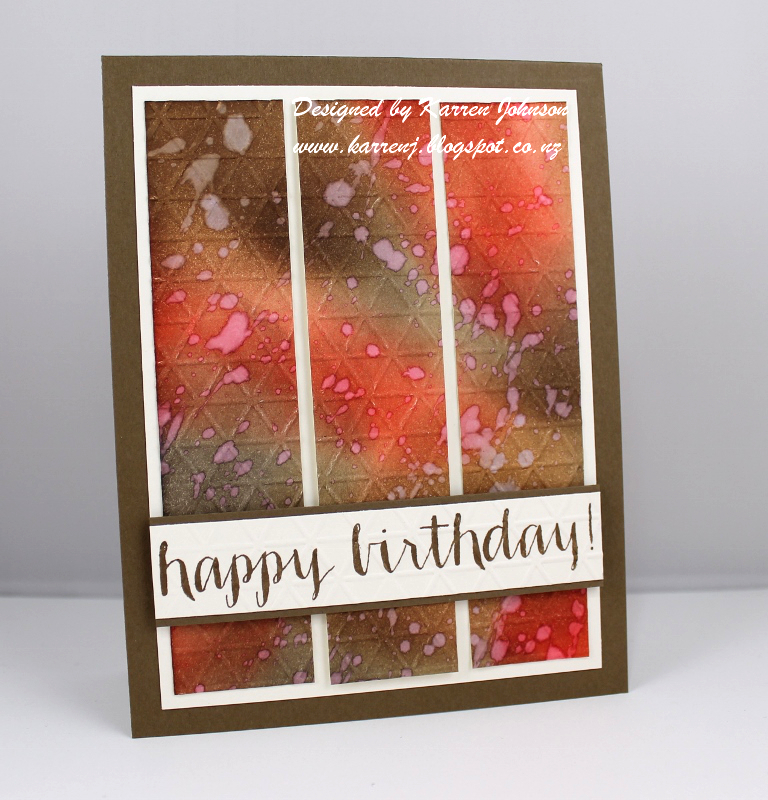 I started with a Tangerine Tango card base which I ran through with the Linen plate to give some subtle texture. 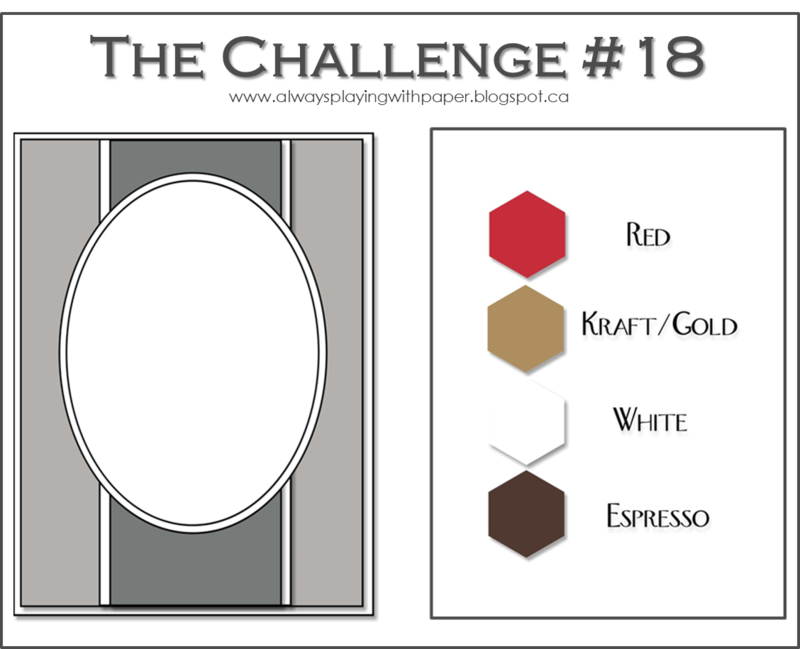 The white panel was stamped with the Circle Scribbles stamp set in both Tangerine Tango and Calypso Coral and was then also run through with the Linen plate. 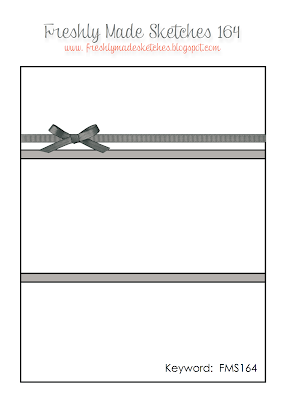 I sewed some vellum onto the card base using three rows of stitching as per the sketch but it didn't show up enough so I covered that up with twine. The Wet Paint die was cut from black cardstock then clear embossed several times to give it a glossy, raised finish. Thanks for visiting. 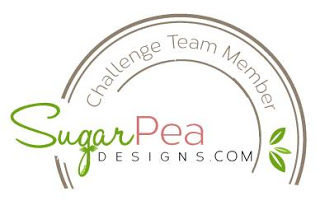 The rest of the design team have some fabulous inspiration for you so I hope you go visit them. When I went into my craft room today, I just didn't feel like stamping :( So I decided just to do a bit of Copic coloring and see where that took me. 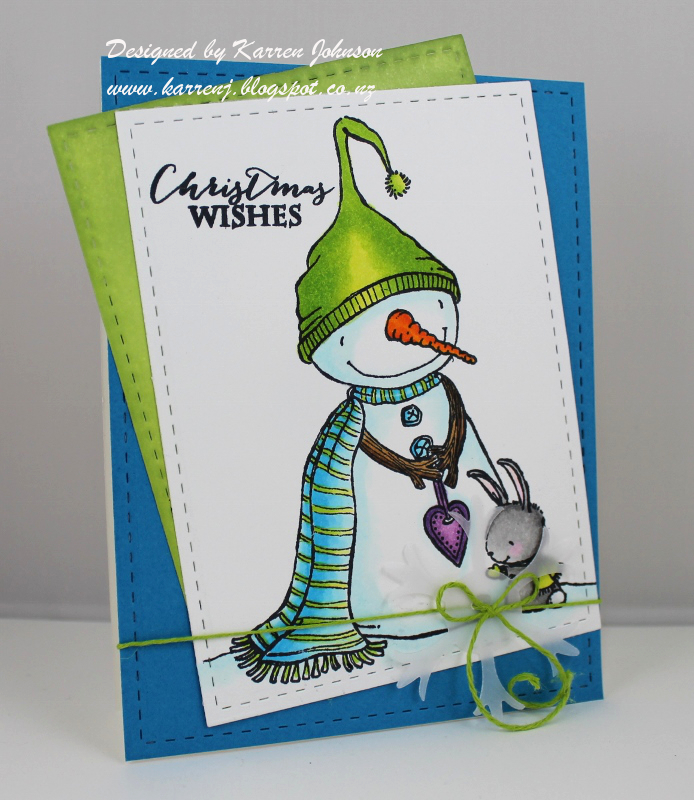 I colored up a beautiful snowman from Purple Onion's Stacey Yacula range and once I was finished, I decided to make him into a card. I went looking for a suitable sketch as this fella is pretty big! I found this week's Mojo Monday and went to work. Isn't this snowman and his little bunny friend just too cute? I cut each layer with stitched dies. For the green layer, rather than use green cardstock, I sponged some Green Apple ink around the edges to give some added interest. 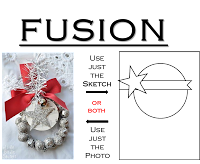 For the round element at the bottom, I didn't want to cover up my bunny, so I die-cut a vellum snowflake, punched two tiny holes in it and threaded some green twine through it before tying a little bow. Looking at the snowflake in the photo, I might paint it with clear Wink of Stella and see if that makes it pop a bit more. Hi and welcome to Merry Monday! 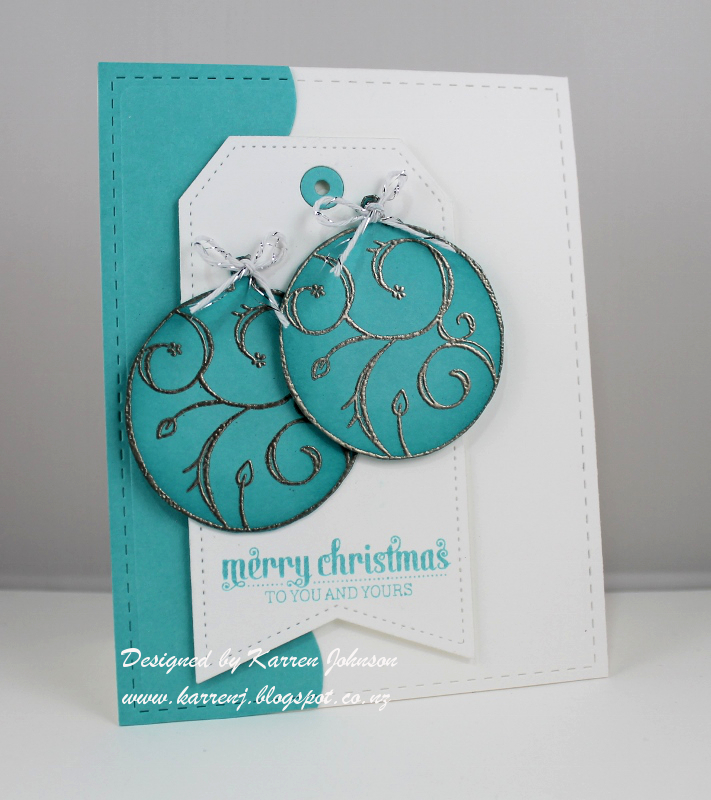 Today, our challenge hostess is Wendy and she is asking us to use blue and silver/gray ornaments on our cards. Isn't that a gorgeous graphic? For my card, I went with my new, favorite blue - Audrey Blue from Simon Says Stamp. I embossed this gorgeous stamp from an Australian company called Stamp-it onto Audrey Blue using Versamark then embossed with Pewter embossing powder. I cut out each ornament and sponged a bit of Audrey Blue around the edges to give it depth. I then tied a wee bow from some silver and white bakers twine. The Audrey Blue strip on the card base was cut with a scalloped die before being glued onto the card base then run through with the stitched rectangle mats die. I love that thing and find myself wanting to use it for every card! It adds so much interest for no more layers. Thanks for visiting. 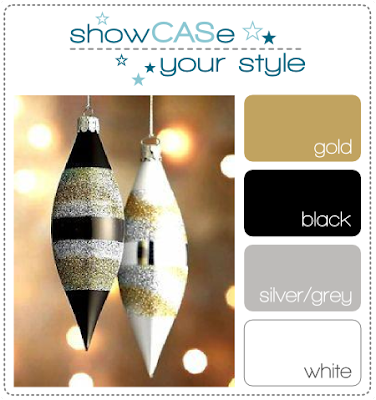 Have you checked out the beauties created by the rest of the Design Team - just gorgeous! 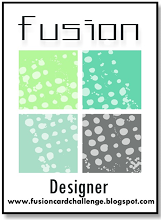 For my second card today, I finally put down on paper what I'd visualised since I first saw the challenge at Fusion. I love that photo and knew I wanted to do a white embossed, sponged panel. I white embossed the script image from Papillon and then sponged in an ombre fashion using Tumbled Glass, Broken China and Island Blue inks. The little flower was cut from Audrey Blue cardstock and the edged were sponged before being put together. A white enamel dot was put in the center. I like the fresh and light look of this card, so the sentiment seemed to fit the look nicely. I received an order from Papertrey Ink this week and I couldn't wait to dive in and use some of it. A couple of the things I received are frequently unavailable, so I grabbed them when I saw they were in stock. Here's the first card I made, using the colors from ColourQ and the sketch from CAS(E) This Sketch. I wasn't going to buy Circle Scribbles and the matching die set because I thought "Scribbles? Really? I can draw those myself!" But they are just so darned cool that I ended up getting them! And as for Wet Paint - I love the font on that set so much! For this card, I only used the dies and cut the smallest scribble out of Peach Parfait, Poppy Parade and Lucky Limeade cardstock. 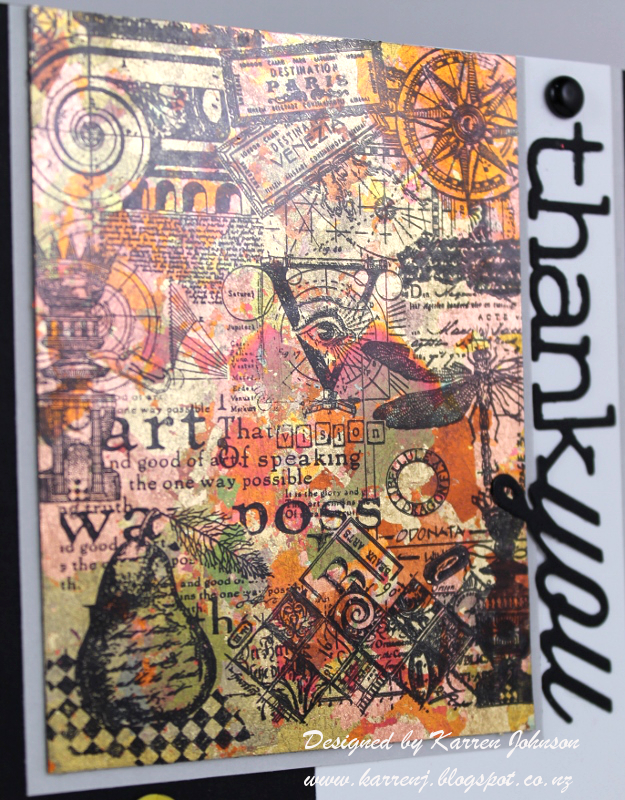 The vertical panel uses the Dot Fade stencil from Tim Holtz and was sponged in Peach, Poppy, Limeade and Handsome Hunter ink in rainbow fashion. The sentiment was stamped in Limeade and Handsome Hunter. Edited to Add: This card won top honors at ColourQ. Today's card is a deviation from my preferred CAS style, but I wanted to see if I could pull off a vintage card. Funnily enough, I had to draw the line at distressing whereas not so many years ago, I used to distress everything! 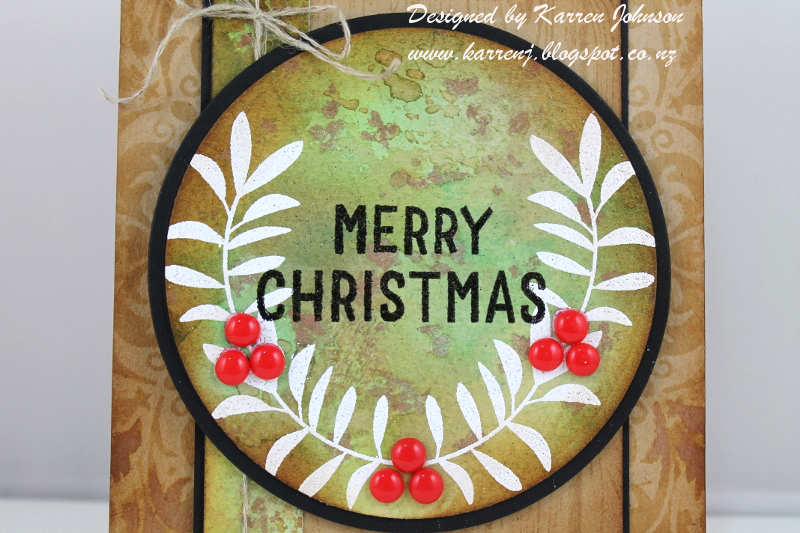 This card uses the vintage theme from The Paper Players and the Wreath theme from Just Us Girls. The circular element was made by smooshing watercolor paper into several green and brown distress inks. The brown splodges are copper alcohol ink which I dabbed on the panel. 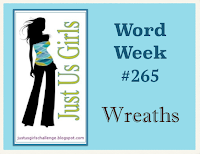 I then white embossed the leaves to form an open wreath and stamped the sentiment. I really like how one of the leaves is poking through the "C" in Christmas. Some bunches of berries, aka homemade enamel dots, finished this panel. The cardbase was sponged with Antique Linen ink over a Memory Box stencil, then the edges were sponged with Vintage Photo ink. The inner panel was stamped with Hardwood then sponged and a strip of the green watercolor panel was also added. Hi and welcome to Freshly Made Sketch Challenge Day! 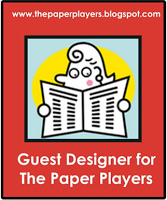 Our hostess this week is the talented and funny Linda Callahan and she has come up with a classic sketch for us. For my card, I used a Copic colored piece I had used for practice. I'd had it sitting around for a few weeks not sure how to use it when along came this sketch which is perfect! This young lady is a digi from Saturated Canary and I colored her up in warm and cool grays, along with a touch of pink. I layered the image onto some Fog cardstock then onto a Basic Gray card base. The die cut sentiment was cut once from Pink Pirouette and once from Basic Gray and layered slightly off-center. I made a rolled rose and added a couple of little die cut leaves and the card was done. 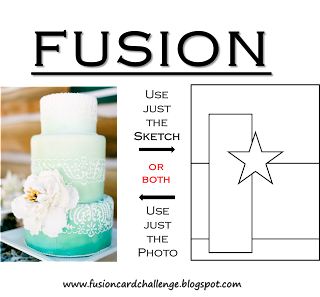 Sorry, Linda, but I didn't put the ribbon/twine element on the card - I thought it would look a bit weird cutting through the middle of her head, so I left it out. Thanks for visiting. I hope you have time to check out the rest of the design team cards - they are gorgeous and varied as always. Accessories: Copics, Thanks die (Clearly Besotted), Mini Rolled Rose die (MFT), Curvy Leaves die (Elizabeth Dies). Hi everyone! A couple of weeks ago, I was lucky enough to have this card chosen as the winner of Lesley's The Challenge. What a thrill! I ended up making two cards for this challenge! The first card was much more layered than I usually make and also used patterned paper - which I rarely use! So even though it's quite a pretty card, when I looked at it, I just wasn't sure. I used a Tim Holtz woodgrain embossing folder on both the patterned paper and the kraft panel which I lightly went over with Vintage Photo distress ink to highlight. The central oval was sponged with Fired Brick and Vintage Photo ink. I left the center lighter than the outsides. 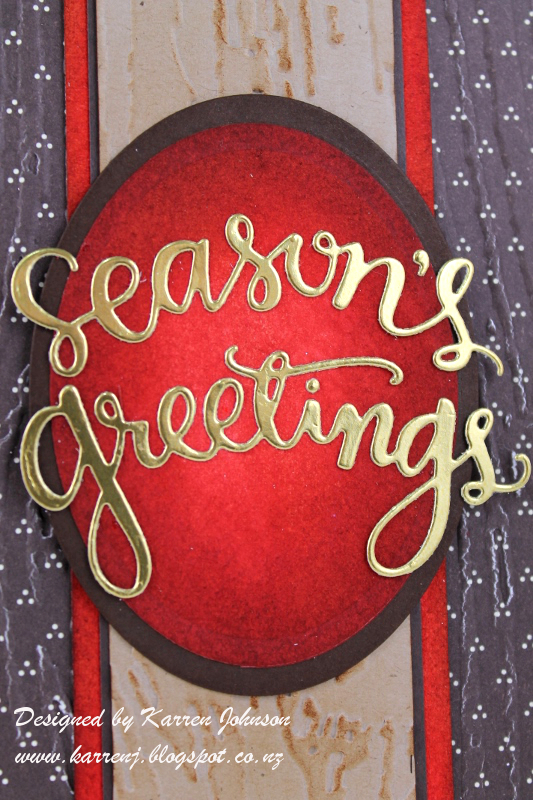 The die cut was cut using gold foil paper and looks really pretty and shiny. Lots of white space here, which I like. Make sure you check out the rest of the amazing talent at The Challenge - Lesley has assembled a very talented team.